It was easier to believe that lie than it was to step out in faith. So I buried my "talents", tried to funnel my desires in "safe" ways, while I prayed earnestly to find my life's calling. God graciously led me to the blog of Ann Voskamp, a lady who also battled fear, only hers was, amazingly, worse than mine. If I was bound up in fear, she was completely paralyzed. In reading her stories of courage and obedience, I became inspired. Something new began to emerge in my own life...a gut-level, undeniable belief in the following verse for the first time in my life. I had heard it my whole life - - "fear is not of the Lord". But I had to come to the point where my love for the Lord and my desire to obey Him overcame my desire to protect myself from impending doom and failure. Pride and self-love had to be put to death. I had to seriously decrease before He could increase! I can't tell you how it happened. I can't point to an exact moment in time. All I know is that as God began gently prodding me to take baby steps out of fear, instead of no...instead of self-protection...I chose Him. I chose obedience. I said YES...and I found Him to be faithful. Each time I said, "yes"...no matter how scary the situation, He came through! As a result, I learned that He is good and that He is indeed, trustworthy. The funny thing I realized is...I'm NOT good enough. I never was and never will be. However, MY GOD IS GOOD ENOUGH! He is all-sufficient and because HE is enough, then I am, too. Truth #9 - You have been given a spirit of power, love, and a sound mind. Power - to go through any trial or persecution you may be facing. Love - to love the Lord and your fellow man. Sound Mind - to remain balanced, just, and prudent in all of your ways. Fear tries so many times to raise it's ugly head against all of those...making you feel like you are alone in a trial, like you don't have what it takes, like the Lord doesn't really love you, like others dislike you, like you are unworthy of attention, like you'll never get it right, like you're going crazy, like you just can't take it one more day, etc. The list of satan's lies could go on and on and on. Today...this day...is the day to put an end to it all! Your birthright from God did not come stamped with the "spirit of fear"! It came fully-loaded with power, love, and a sound mind. 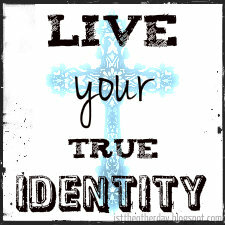 That is your identity as a Christian. Trust in it! Live it!